More on our holiday at the Camping du Letty site in Benodet. The town of Benodet is about 30 minutes’, mainly flat, walk from the campsite and is very pleasant. Benodet has a large, tree lined, promenade and beautiful beach of fine sand. There is a children’s club on the main town beach. Benodet has a limited range of shops and restaurants and a weekly market on the main car park. There is a small Carrefour Supermarket on the outskirts of the town and this, also, has the town’s only petrol station. There is a large Tourist Information Office on the main road leading to the sea from the town’s outskirts with helpful staff who speak excellent English and a comprehensive range of tourist leaflets. There is, also, a Post Office and several banks with outside cash dispensers. The Intercontinental Church Society runs family Church services in English at St Thomas Catholic Church near the harbour every Sunday morning during the months of July and August. We went to these services, as we have done in previous years, and enjoyed the warm welcome we received. 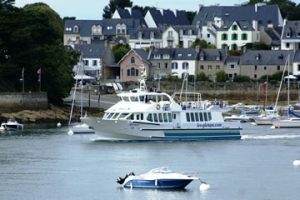 From the harbour the boat company “Vedettes de L’Odet” run boat trips, in their large motor cruisers, along the River Odet to Quimper and to the offshore Iles de Glennan archipelago. We have taken the 10 mile trip to the Iles de Glennan in previous years. There is a little on the main Island of St Nicolas, the tourist boat destination, other than sailing school and diving schools, a restaurant and some holiday cottages. There is a lighthouse and a small fort on some of the other islands but these are not accessible without one’s own boat. 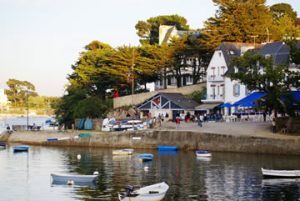 The white sand beaches and emerald green seas of these low-lying islands are, however, spectacular and the islands are a popular destination for summer day trippers from Benodet and several other local ports. “Vedettes de L’Odet”, also, has a “glass-bottomed” catamaran, with undersea viewing windows, which operates trips to the Iles de Glennan. The tickets for the “glass-bottomed boat” are VERY expensive and we have never taken this trip. For the more energetic there are, also, organised kayak expeditions to the Iles de Glennan, advertised at Du Letty. I believe that the kayak expeditions are accompanied by a motor boat. Across the estuary from Benodet is the picturesque small port of Sainte Marine. This can be reached by a passenger ferry during the day or by driving over the high level bridge over the River Odet. The view from the bridge over the river estuary and marina is really spectacular. The harbour at St Marine is surrounded by a number of bars and restaurants with outdoor terraces. We enjoyed a pleasant evening meal at an outside table at a small pizzeria that we have visited previously. The moonlit view over the river estuary to Benodet was magical. The annual celebration of the Feast of the Assumption in Benodet on 15 August is not to be missed. 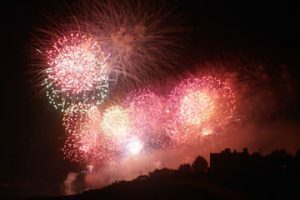 There is a night time procession of illuminated ships followed by a magnificent firework display launched from a platform in the bay. On the festival night there is live music and other outdoor entertainment in the centre of the town but it gets very busy and crowded with many visitors travelling into the town from other areas. On the night of the Feast of Assumption we walked along the beach from the campsite and then the Corniche de La Mer and found a vantage point overlooking the bay. From this vantage point we were able to watch the illuminated procession of ships and then the spectacular firework display which is launched from a platform in the bay. As in previous years the firework display was one of the best we have seen anywhere. There are a number of interesting places to visit nearby. The Cathedral city of Quimper about 15 miles away has a lovely centre with flower decked bridges over the river Odet and an interesting Cathedral. There are, also, several large hypermarkets with adjacent Centre Commercial (shopping centres) as well as a range of smaller shops including a Lidl supermarket, around the city. We visited the Lidl and large hypermarkets for some of our food shopping. On our final Sunday, 21 July, we went to the English language Church service at Nevez. Whilst in Benodet we had been “chatting” via “Caravan Talk” with forum moderator Gordon and his family. They were holidaying in their luxurious motorhome on a pitch at a campsite in Raguenes Plage. Gordon very kindly invited us to lunch. We met Gordon and his family at the Church service, as we had arranged, and followed them to their huge and stunning motorhome where we were treated to a delicious barbecue. After lunch we took the opportunity of visiting the picturesque riverside port of Pont Aven, formerly a haunt of impressionist painters. Pont Aven is built along a river valley and in its industrial heyday had more than 7 water mills. These mills have now been converted into restaurants, shops and art galleries and the riverside walk and bridges are bedecked with geraniums. We walked around the town and along the riverside walk. 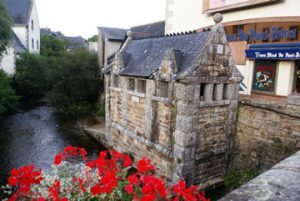 Pont Aven, also, has an ancient public toilet near the main bridge, which is justifiably famous! That evening we drove on from Pont Aven to the fishing port of Concarneau to visit the final night of that town’s annual Fillet Bleu Festival. Concarneau is a pleasant town and its historic Ville Close on an island in the harbour is worth a visit. The Ville Close is mainly one street lined with restaurants and souvenir shops and surrounded by ancient castellated walls. During the Fillet Bleu Festival there is traditional outdoor musical entertainment and a spectacular firework display over the harbour. On previous family visits to Benodet we had treated the Fillet Bleu Festival’s final night as a holiday “grand finale”. We would dine out at one of the pavement restaurants in the Ville Close and watch the firework display overhead. Unfortunately this year the restaurants had all closed earlier and we were reduced to a take-away kebab and chips from a stall before joining the crowds standing on the quayside to watch the fireworks. The fireworks were good but not as good as the Benodet ones. We very much enjoyed our return visit to Camping Du Letty – so much so that we booked 4 weeks for summer 2012 as soon as the 2012 booking opened in November 2011. Camping Du Letty is NOT a very cheap site but we feel that its many “free” facilities and its ideal location make it very worthwhile. We paid 508€ for our 15 night stay which at that time was equivalent to a total of £447.19 or an average of £29.81 per night. That was for the 2 of us, Max the collie and a 10amp EHU. (The site offers different sized electricity supplies at various prices by fitting different sized contact breakers in its EHU boxes.) Another English caravanner kindly gave us some spare “Daily Mirror” discount vouchers which gave us a 30% discount off 2 nights of our stay. That discount is included in the above prices. Our stay was partly in the Peak season and partly in the Mid-Season tariff wise. We highly recommend this site although we’re still not on commission!?? For anyone considering the possibility of visiting Camping Du Letty the campsite’s website is excellent and includes an online booking facility. The increased popularity of the site does mean that the management have now changed the booking procedures. Previously it was possible to just turn up and get a pitch or book in advance without any deposit. For Summer 2012 onwards it is necessary to give firm dates and pay a non-refundable deposit of 30% of the cost of the booking. In addition the first row of pitches, fronting onto the beach, have been named as ‘Premium’ pitches with prices to match! In 2011, as already explained, we drove down from Calais stopping off overnight at the Municipal Campsite at Pont Farcy on the outward and return journeys. For 2012 we have booked a crossing with Brittany Ferries from Plymouth to Roscoff. We have got a good fare through the Caravan Club for the 2 of us, car and ‘van. We included 7 Camping Cheques in the package as this lowered the price – I hope to sell those on as we cannot use them ourselves them as our visit has to be in the School Holiday peak season. Although the ferry crossing is much more expensive than our usual Norfolkline/DFDS Dover to Dunkerque crossing this will be partly balanced out by the lower fuel costs in France and the additional benefit of avoiding the M25 during the Olympic season! On the morning of Wednesday 24 August we departed from Camping Du Letty on our homeward journey. We had deflated the boat, taken down the awning and packed the car the previous day. We gave Madame Christine a bouquet of flowers and a box of chocolates for the other staff because we had had such a super holiday. Header banner image credit to Sebastien D’ARCO [CC BY-SA 2.5 (https://creativecommons.org/licenses/by-sa/2.5)], from Wikimedia Commons.